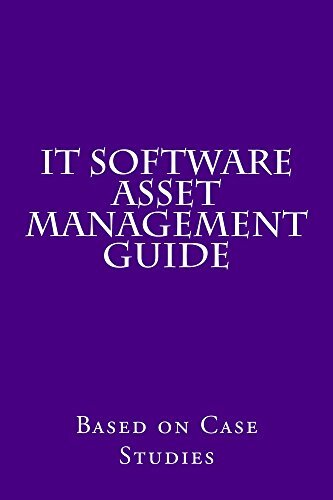 [PDF] IT Software Asset Management Guide: Based on Case Studies | Free eBooks Download - EBOOKEE! Description: Welcome to this book on IT Software Asset Management Guide. It is a Best Practice guide based on actual case studies in pioneering, designing and implementing software licence management frameworks across diverse organisations. The guidelines in this book are mainly derived from a process of innovative ideas, their adoption and eventual optimisation. They can be tailored to suit individual requirements of each organisation and the changing times. Business, Software and Licences are intertwined with each other. Most businesses and organisations have huge investments in software and each software deployed or unused requires a valid licence. Each one of us is affected by licences since we use at least one software as part of Business or IT or as a customer. However, not much effort is put to manage these assets efficiently. This book serves two major objectives. Foremost, it tries to understand, Why is it imperative to focus on software asset management? Secondly, it traces the key steps of the journey in implementing a robust framework based on actual case studies in different organisations. It will help you understand the importance of software licence management and provide concise guidelines to implement a framework that is apt for your organisation. It will also help you realise that software assets are no longer liabilities once you have effective control on the total cost of ownership that guarantees a higher return on investments. No comments for "[PDF] IT Software Asset Management Guide: Based on Case Studies".